When we thought that the walk around Armenian street was over, we were excited when we discovered one more piece of art around the corner! 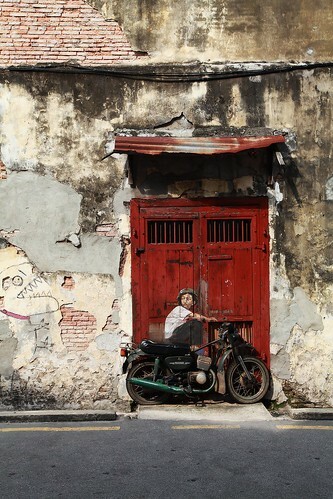 This kid on the bike was not literally on a wall but on a door so I was wondering if this is called the door painting? For this, an old bike was secured firmly against the wall as part of yet another work by Ernest Zacharevic. Another thing that attracted me is that the wall painting was done not on a clean wall but an dirty wall with paint peeling off. I sort of like the feel of the whole picture that I am sharing below as the whole image did not give me a clean feeling as it looks like it has a long way back. In my opinion, the red old door did give my picture a very nice touch and color contrast. It did not take us long to stroll around the lanes in Armenian street to visit the wall paintings, in fact, it only took us less than half a day to do that. The picture shown below was taken with 16-35mm f2.8L USM on 5D II. Thank you and I will certainly follow my heart in writing my articles which I have been doing all along! Yes! These are in Georgetown and it was pretty cool to be there! Well, you can always visit Penang again. I couldn’t make out what that is but it looks more like a dinosaur to me! Haha! yup. If I am not mistaken it is a dinosaur. Cheers! Haha!! Ya, it certainly looks like one! Cheers!! You will definitely have the chance to travel out of america and who knows? One day, you might get better pictures than me! Cheers! Take care! This is a great find! And the composition just works nicely. Thanks for sharing. Thank you so much for your comment! Cheers! Went to Penang last November for the marathon and accidentally stumbled upon this piece of art. Was trying to look for it earlier but to no avail, until on my last day in Penang, ate capati at a nearby stall, and saw this. Missing Penang so much! Yes! I’m already missing that place too! Thank you for your appreciation! Cheers! This is cool! I also really like your blog. Thank you for liking my blog! Please, feel free to follow!